The Record » The Man from U.N.C.L.E. 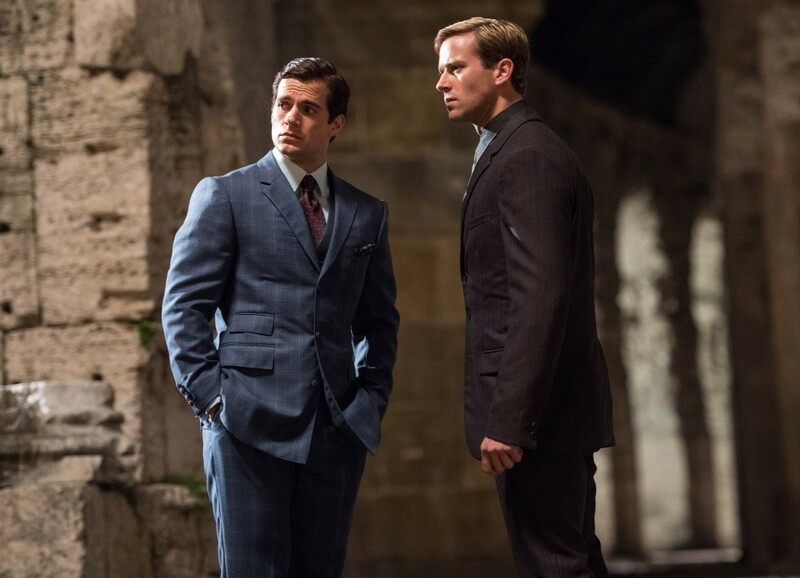 Henry Cavill and Armie Hammer star in a scene from the movie “The Man From U.N.C.L.E.” PHOTO: CNS/Warner Bros.
Another cultural landmark of the baby-boomer generation returns to the foreground with the arrival of the breezy espionage yarn, The Man from U.N.C.L.E. The droll humour that punctuates director and co-writer Guy Ritchie’s adaptation of the mid-1960s television series, as well as the James Bond-style glamour that permeates it, will likely please viewers. But they’ll find little of substance to take away with them once the final credits roll. Still, in collaborating with Lionel Wigram on the script – and in helming the proceedings – Ritchie does keep the violence sufficiently vague to make his film acceptable for a broad adult audience. Though its action is set at the height of the Cold War in 1963, this origin story’s premise recalls the alignment of forces that prevailed during the Second World War two decades earlier. That’s because the Kennedy-era adversaries of East and West have once again agreed to cooperate, as they had – however uneasily – in the glory days of the big bands. And the motive for their temporarily repaired alliance? Same as it ever was: fighting the Nazis. Hitler’s leftover minions, and their Mussolini-loving comrades from south of the Alps, are back, it seems, to causing trouble. This time, they’ve managed to spirit away prominent scientist Dr Udo Teller (Christian Berkel). Teller is the genius behind a revolutionary development in nuclear know-how that, should it fall into the wrong hands, would spell doom alike for DC and the Kremlin. So it’s time to play nice, much to the machismo-driven chagrin of two apparently born enemies: Napoleon Solo of the CIA (Henry Cavill) and Illya Kuryakin of the KGB (Armie Hammer). Yet these forced friends turn out to have more in common than they initially realise, since neither serves his government with a truly willing heart. Suave Solo is an ex-GI who took to plundering art treasures in the waning days of the war. The use the intelligence establishment can make of his underhandedness is the only thing standing between Solo and a long stint in prison. For rage-prone Kuryakin, it’s the stick – not the carrot – that keeps him working as a spook. His disgraced father, we learn, fell from Stalinist favour, and was carried off to the gulag. Rounding out the team formed by these unwilling collaborators is Dr Teller’s estranged daughter, Gaby (Alicia Vikander). Gaby is a skilled auto mechanic whose Solo-aided escape from East Berlin serves as the movie’s opening adventure. Together, this improvised trio tracks the suspicious activities of Alexander Vinciguerra (Luca Calvani), the shady heir to a fascism-tainted Italian industrial fortune, and his scheming, but oh-so-elegant wife, Victoria (Elizabeth Debicki). As Solo and his colleagues shadow the couple, audiences get a taste of la dolce vita courtesy of a high-end stay in Rome, a day at the speedster races and a visit to the Vinciguerras’ private island. Along the way, a substantial, if slightly strange, relationship blossoms between Illya and Gaby. But their more or less respectable tether is ethically offset by Solo’s carefree philandering – though, admittedly, Ritchie deals with his Napoleon’s conquests more by implication than demonstration. The picture’s underlying anti-war, pro-friendship sentiments are congenial enough. Yet reflective moviegoers will note that they rest, to some extent at least, on an implied moral equivalence between the Soviets and their Western foes that’s wholly at variance with the truths of history.